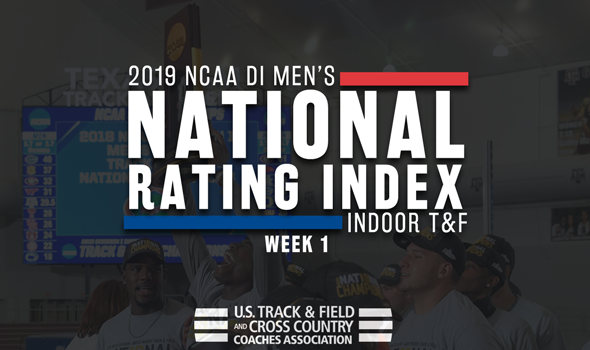 NEW ORLEANS – The top-5 of the NCAA Division I Men’s Indoor Track & Field National Rating Index looks slightly different from the preseason. Texas Tech remains the No. 1 team in the nation, while Florida and Florida State are still neck and neck for the runner-up spot. Houston jumped two spots and swapped places with Texas, a team that fell to sixth behind still fifth-ranked Georgia. The Red Raiders actually extended their lead on top of the TFRI thanks to the efforts of Andrew Hudson and Odaine Lewis in the first few weeks of the season. Hudson clocked a time of 20.48 in the 200 at the Red Raider Open to move up to No. 4 in the TFRI Individual Rankings, while Lewis notched a pair of strong marks in the long jump and triple jump. Grant Holloway made his debut for the second-ranked Gators and proved why he could contribute big points to their cause come March at NCAAs. Holloway posted a pair of all-time top-10 marks in the 60 hurdles when he doubled down on 7.49s (t-5th in collegiate history) and reeled off a blistering clocking of 20.69 in the 200. The Seminoles made up some ground on Florida after strong performances across the board and are knocking on the door of their first top-2 spot since the 2010 season. Kasaun James gave Florida State the biggest boost thanks to a lightning-quick time of 6.57 in the 60, which ranks him No. 3 in the TFRI Individual Rankings so far. The Cougars own their best ranking in program history after a number of big efforts this past weekend. Houston’s 4×400 relay team notched a nation-leading time of 3:03.75 and became the fourth fastest program in collegiate indoor history in the process, while Mario Burke turned in a time of 6.58 in the 60 and is now ranked fourth in the TFRI Individual Rankings in that event. The Bulldogs held steady at No. 5 and were buoyed by the performance of senior hurdler Michael Nicholls. He bounded his way to a time of 7.67 in the 60 hurdles, which puts him sixth in the TFRI Individual Rankings in the early goings. LSU soared nine spots between the preseason and Week 1 and are back in the top-10 for the first time since 2017. The Tigers, who went from No. 17 to No. 8, watched Rayvon Grey (long jump), JuVaughn Harrison (high jump) and Damion Thomas (60 hurdles) all move into the top-8 of the TFRI Individual Rankings in their respective events. North Dakota State comes in ranked No. 20, which is its best ranking in program history. Senior thrower Payton Otterdahl is a one-man wrecking crew for the Bison as he is ranked No. 2 in the TFRI Individual Rankings in the shot put and fourth in the weight throw. The biggest jump out of any program belonged to Sam Houston State. The Bearkats jumped 57 spots from No. 83 to No. 26 after the first few weeks of the season. Needless to say, that’s the best ranking in program history. Be sure to check back next week as well as every week leading up to the 2019 NCAA Division I Indoor Track & Field Championships from March 9-10 in Birmingham, Alabama.